Be the first to share your favorite memory, photo or story of Marcella . This memorial page is dedicated for family, friends and future generations to celebrate the life of their loved one. Marcella J. 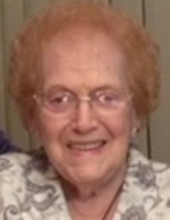 “Peggy” Garn, 95 of Ashland and formerly of Spencer, Ohio passed away at Brookwood Place in Ashland on Friday, Aug. 10, 2018. She was born in Lodi, OH on Feb. 7, 1923 to Russell and Dorothy (Myers) Howe. She graduated from Spencer High School in 1941 and on Jan. 28, 1943 she married Ross E. Garn. During the last 2 years of WWII Peggy worked at Goodyear Aircraft making parts for the F6F Hellcat Fighter Plane. Later she worked at Walter’s Market in Spencer until 1988. She was a member of Spencer United Methodist Church and Spencer American Legion Auxiliary. She was preceded in death by her husband Ross, grandson Jeff, daughter-in-law Vickie, grandson-in-law Todd, 3 brothers and 5 sisters. Visitation will be held Tuesday, Aug. 14, from 6:00 – 8:00 PM and also Wednesday from 10:00 – 11:00 AM at the Parker Funeral Home, 202 East Main St., Spencer, where the Funeral Service will be held Wednesday at 11:00 AM. Rev. Benjamin Roby, Chaplain for Hospice of North Central Ohio will officiate. Burial will follow at Spencer Cemetery. Memorial contributions may be made to either Hospice of North Central Ohio, 1050 Dauch Dr., Ashland, OH 44805 or Brookwood Place, 1998 Center St., Ashland, OH 44805. "Email Address" would like to share the life celebration of Marcella "Peggy" Garn. Click on the "link" to go to share a favorite memory or leave a condolence message for the family.